As part of Blogtober, I'll be re-running some past posts that fit this month's theme. This post was originally published in November 2013. I love a theme! 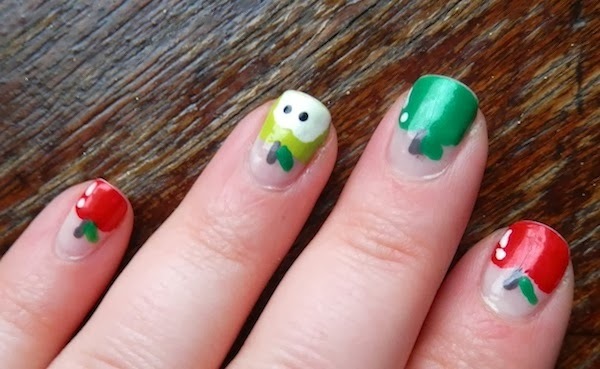 After my Halloween nail art, I was getting kind of bored with regular nail polish so I wanted to create another seasonal manicure. Instead of traditional Thanksgiving nails (okay, maybe those aren't traditional for most people), I wanted a general autumn situation on my nails. I almost went with leaves, you guys, but since I didn't get to go apple picking this year, I had to go with my favorite fall fruit. Plus, I had this vintage apple fabric for the backdrop so it was kind of inevitable. Start with a base of the pale polish. I'm using one meant for a French manicure. You can also just start with bare nails, but this adds a more polished (PUN ALERT) finish. 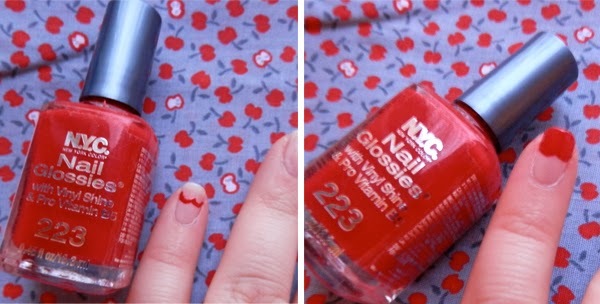 Use the small end of a dotting tool (or a nail art brush) to draw a curved line that looks like the top of an apple [a] across the middle of a nail. Fill in the space below the line to create the apple [b]. Repeat on all nails, using different shades. 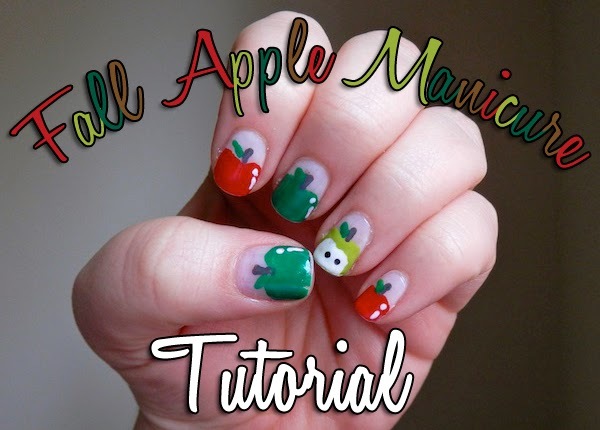 Use the brown nail polish to add a small stem above each apple shape. Use the green striper or the green polish on a brush or tool to add a leaf shape next to each stem. For a fun variation, create a sliced open apple by painting a white shape that mimics the apple shape inside one of your apples. Add two black dots for seeds. Use the dotting tool or a brush to add a white highlight mark on the right edge of each apple. I know bananas come in a bunch, but what do apples come in? Whatever that is, you have one now! 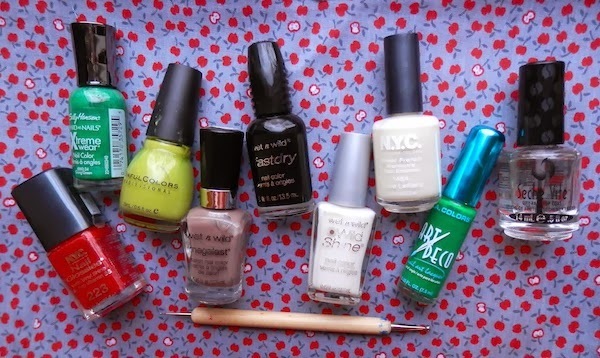 Are you into seasonal manicures? What would you choose for fall nail art? What do your nails look like right now?